Remember the old ads that said it wasn’t nice to fool Mother Nature? Lately it seems that Mother Nature has been getting even with us. Exploding volcanoes led to the biggest worldwide disruption in air travel since 9/11. Major earthquakes caused death and destruction in Haiti and Chile. Hurricanes, floods, tornados have all been in the new lately. No matter how advanced we’ve become, we are still at the mercy of natural forces. All the technology in the world doesn’t help us fly jumbo jets through volcanic ash that shuts down jet engines or allow us to easily maneuver amidst earth tremors that crush buildings. Not much we can do about these kinds of situations. Or is there? Our popular teleseminars offer an easy, low-cost way to learn about the latest marketing strategies, trends, and techniques – without ever leaving your office. Our next teleseminar, scheduled for May 20th is Standing Out From the Crowd. 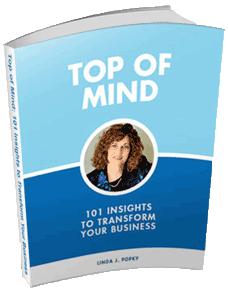 We’ll focus on how to differentiate your business by building thought leadership. Metrics have a reputation for being difficult to use and hard to decipher. But not anymore. We’re very pleased to host a webinar on June 3rd with marketing metric expert Roger Best who will show us how to use marketing metrics to achieve profitable growth. 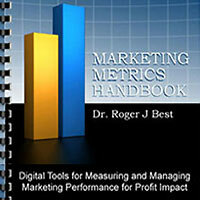 Roger will introduce his new Marketing Metrics Digital Handbook, an easy, interactive way to use to help your company or consulting practice better measure and manage marketing performance and profitable growth. Wish you could create more powerful, impactful proposals? Learn how at the Women in Consulting workshop Creating Powerful Proposals, June 22 in Mountain View, CA. You’ll learn how and when to create proposals that work for effectively to help you close business. More information. Tune up your marketing with our special pre-conference marketing workshop at this year’s IMC Confab conference for consultants in Reno, October 23rd. Take advantage of early bird pricing by registering now. Get your own personal business advisor – someone you can call with a new business idea or strategy, review proposals, or strategize client situations. Contact Linda to find out more about the Private Roster Mentor Program. Limited slots are available now. Upcoming guests include Jeff Eagle on viral video production and capturing the live experience, Curtis Bingham, on the up and coming role of Chief Customer Officers, and Roger Best on interactive marketing metrics. Join us for the monthly Business Marketing Association (BMA) Marketing Strategy Roundtable breakfast meetings on the last Tuesday of each month at Scott’s Seafood in Palo Alto. Modeled on BMA’s successful series of roundtables on product marketing, branding, and other marketing areas, the new series will feature dynamic speakers focused on marketing strategy topics of interest to Silicon Valley marketing professionals. Past speakers have included Brett Olszewski of K/P Corp on On Demand Marketing, John Assalian of Viewstream on Content Marketing, and Charlene Li of Altimeter on open leadership and social technology. Upcoming speakers include Lorie Loe of Eccolo Media on Optimizing Collateral in a Web 2.0 World in May, and Adrian Ott on the 24 Hour Customer in June. 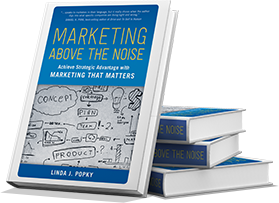 Leverage2Market’s Linda Popky has joined the Women in Consulting Leaders Network. As past president of the organization, she is also a member of the WIC Board of Directors. In March, Linda was the keynote speaker for Unisfair’s Webinar on Virtual Events. Watch her presentation. Linda was the moderator for Agility: The Key to Building a Successful Career, part of Fountainblue’s When She Speaks Women in Leadership Series in March, and a facilitator for the Executive Women’s Leadership Forum at the Invent Your Future Conference in April, where she also hosted a roundtable on starting a consulting practice. Linda was the instructor for Customer Focused Marketing and Strategic Marketing Perspectives for UCSC Silicon Valley Extension’s Silicon Valley Business Leadership Program. We are in the process of booking our Summer and Fall ’10 speaking schedule. If your business or association could use a dynamic, thought-provoking presentation or workshop on marketing or business strategy, please contact us.